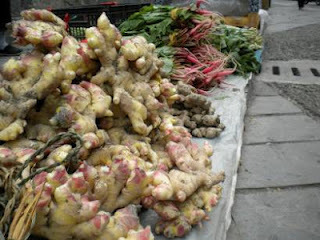 Miao Village market in China. Ginger galore. Oh my. As October closes in cooler weather should start to prevail and the markets should start filling up with a variety of fall favorites: sweet potatoes, squash, apples, pears (nashi), and more. Surprising summer stragglers, such as eggplant, will be around showing off their colors and tempting shoppers, too. For me, this is when the real bounty begins, so I plan on taking a backpack to cart home all the goodies. See you there!